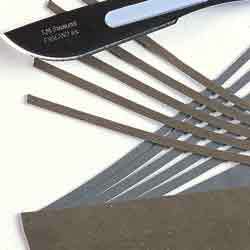 Tungsten Sheet from Veniard is easily cut, wrapped, or shaped with either scissors or scalpel. (Picture shows scalpel for illustration only). Use tungsten for sinking flies fast. Each pack contains 1 Tungsten Sheet, size approx. 85 mm x 130 mm and 0.5mm thick - natural dark grey. Tungsten is approx. 150% heavier than lead and about twice that of brass by volume. Just what I wanted..not for fishing though...I make model vehicles and this helps weight some down. Great!